Sophisticated, executive freehold townhome in elegant, two year old complex. Situated on the east end of Leslieville near The Beach in one of Toronto's hot neighbourhoods! Attractive, French Provincial style brick with mansard roof. Three storey exterior is combined with a light filled open concept interior. Outstanding combination of location, price & worry-free lifestyle offers remarkable value for first time or investment buyers. 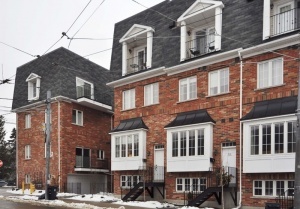 Gorgeous Townhouse in Trendy Leslieville! Sophisticated, executive freehold townhome in elegant, two year old complex. Situated on the east end of Leslieville near The Beach in one of Toronto's hot neighbourhoods! Attractive, French Provincial style brick with mansard roof. Three storey exterior is combined with a light filled open concept interior . Spacious! 1943sqft, 3 bedroom, 3 bath plan, features gorgeous upgraded kitchen, master suite and awe-inspiring rooftop patio. Extra Sunny End Unit , just like semi as it has additional side windows and only one attached neighbour. Built-in garage offers coveted parking space and lots of storage. Close to trendy shops, restaurants and public transit. Enjoy the Lake and nearby Beaches parks for walking the dog. Outstanding combination of location, price & worry-free lifestyle offers remarkable value for first time or investment buyers. Conveniently located between Greenwood and Coxwell at Queen Street East. Take advantage of the urban chic of Leslieville and the casual lifestyle of the Beach community. Run, bike or blade along the Martin Goodman Trail and Leslie Street Spit , enjoy sports and dog walks in the parks and the numerous recreational opportunities on the waterfront. GO GREEN! - lots of TTC and public transit routes connecting to downtown. Steps to the Queen Street streetcar which runs 24/7 across Toronto. 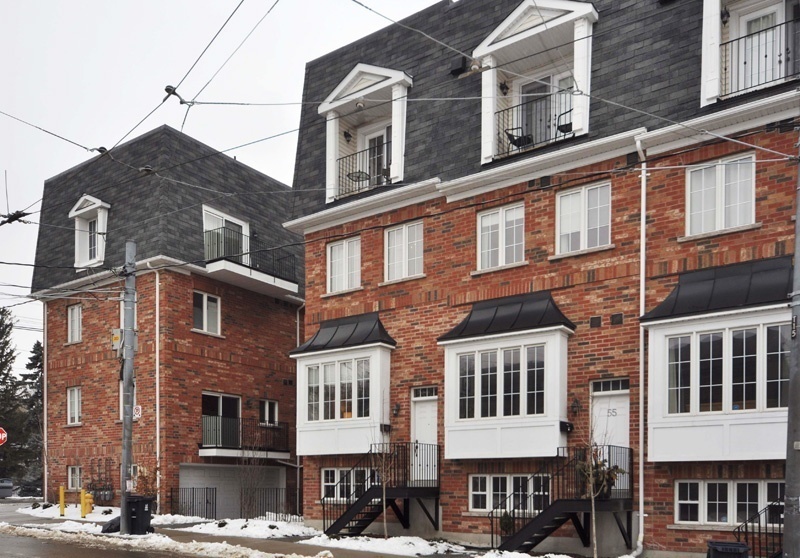 Direct access to the Danforth subway line via either Greenwood or Coxwell stations. The Eco-option is a quick bike ride to your downtown destination. Very convenient by car to reach the DVP, Lakeshore & Gardiner Expressway. Amazing, eclectic shopping in the Leslieville neighbourhood stores or at the Leslieville Supercentre. Some of the best coffee shops in the city! Foodies will love dining out in the many hip, happening restaurants along Queen Street East. "Ashbridges Commons" end unit townhouse was built by Beaverbrook Homes in 2008 and was extensively upgraded by the present owners. Best of both worlds - 1943sqft of modern amenities & luxury in new build construction, situated in an old established neighbourhood. Easy budgeting ! You can move right in with nothing to be done! Still under 7 year Tarion Warranty . Open concept main floor combines the living room and dining area with gourmet kitchen for optimum entertaining. Decadent bonus of a main floor powder room . Main level is highlighted by dark stained hardwood floors throughout and ten foot ceilings . Upgraded smooth ceilings (no nasty popcorn ceilings here!) Potlights on dimmers create a warm ambience. Well designed, dark wood chef's kitchen with extensive cabinetry and extra pantry is upgraded with attractive tile backsplash, under cabinet lighting, granite counter, halogen lights and 4 top of the line stainless steel appliances. Sunlit and bright with large west and north windows to flood the home with natural light. Enticing Master bedroom suite occupies the entire second floor. Enjoy His & Hers walk-in closets plus 4 piece ensuite bath with upgraded granite countertop. Stacking washer/dryer is also located on the second floor for convenience. Second and third floors offer 9 foot ceilings . 2 spacious bedrooms on third floor with double closets are ideal for kids, family/guest room, or home office . 3rd bedroom includes a lovely west facing balcony to take in the city skyline. Matching upgraded granite counter tops are found in all three bathrooms including the 3rd floor full bath. Generous storage space & closets throughout home. Oak staircase leads to impressive oversized private rooftop terrace with open view of the Toronto skyline and sunsets. The CN Tower is truly spectacular in the evening! Terrace has been upgraded with recycled rubber padding for comfort and quiet. There is plenty of space for a dining table, a barbeque and parties! It's an "outdoor living room". Private built-in garage parking spot is easily accessed from common lane way complex. The electric garage door is unique with single door walk thru as well. Convenient access to garage from inside the house!